Types of Art: Tabwa carvers produce many beautiful utilitarian objects such as combs, drums, and bellows, but also produce sculpted figures representing ancestors and twin figures. 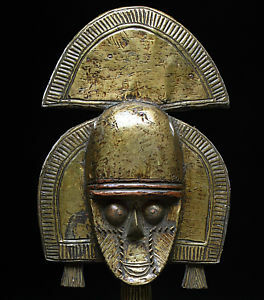 Although a few masks exist in collections, very little is known about them. Religion: The Tabwa have developed a system of religion honoring the ancestors. Similarly to the Luba, the Tabwa have utilized this system in a way which benefits the traditional leaders, who use the remembered power of their ancestors to explain their current power. Ancestors are embodied in figural sculptures known as mikisi, which are carved by religious specialists, anointed with clay, and given offerings of food during the new moon, a time which is of great importance to the Tabwa. The new moon is represented by the triangle in Tabwa iconography and symbolizes rebirth and the continuity of life.